by Bevan O’Daly – 2nd year student, MPhil Textile Conservation. As I near the end of the two-year course, it’s time put theory into practice. 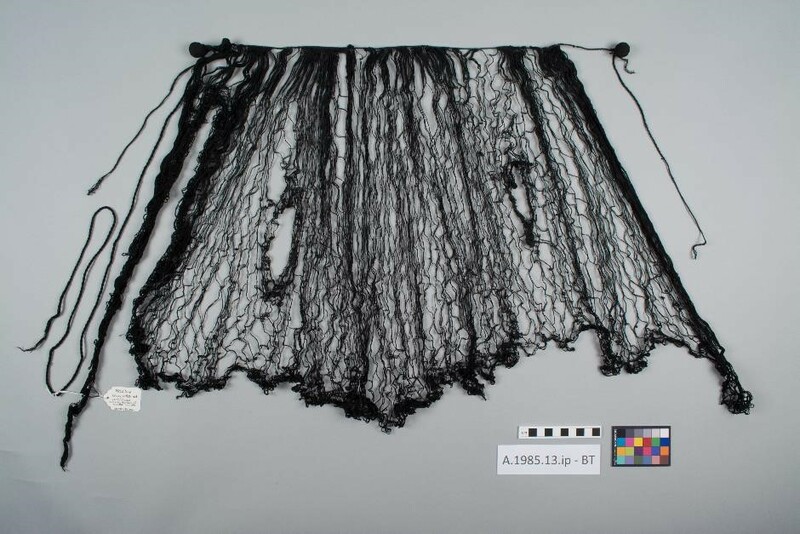 For one of my final projects I was given the challenge to conserve a black netted shawl from the Sande Society of Sierra Leone (A.1985.13.ip). The object belongs to Glasgow Museums, with whom the CTC has built a great working relationship with over the past number of years. It is one of many objects from Sierra Leone collected by Guy Massie-Taylor, a sculptor interested in African art who spent seven years based in Sierra Leone as an Education Officer in the British Colonial Service as an art teacher. He travelled extensively in southern Sierra Leone, where he collected predominantly Mende art objects. 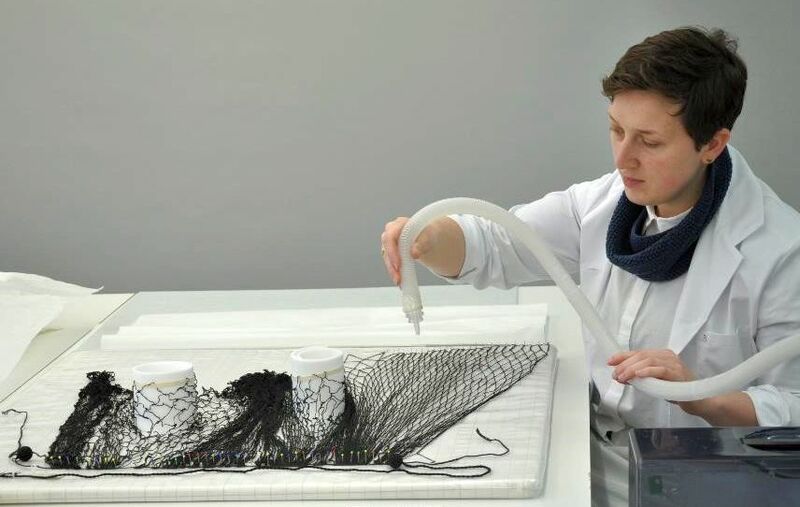 I received the object for treatment as a long narrow bundle of black cotton thread, and from there it was carefully unrolled and laid out flat to reveal its large open net structure. The shawl was distorted in shape and featured various twists and tangles, breaks in the thread construction, and what appeared to be blades of plant fibre loosely attached throughout. Having never worked with an object quite like it before I felt compelled to find out more about the Sande Society and who may have worn it before I began conservation treatment. Before treatment © CSG CIC Glasgow Museums Collection and University of Glasgow, 2017. The Sande Society is a community of adult women of the Mende people from Sierra Leone, Guinea, Liberia and the Ivory Coast. (The Poro Society is the name given to the male equivalent secret society). Elders of the community take pubescent initiates away from their families and go deep into the forest for weeks or up to months to begin their transition into adulthood through various traditional rituals. The female initiates, Mbogboni, are trained to be good wives, mothers, and respected members of the community. The art of dance and performance is placed in high regard during their training as it is considered essential to their success as individuals. Throughout the course of their training the dancing Sowei (sometimes also written as Sowo) performs to the community to share information regarding the stages of ritual that the initiates have completed before they return to the community as adult women. The main feature of the dancing Sowei is the carved wooden mask or helmet, which is polished and stained black. The dancing Sowei embodies the ideals, confidence and power of Sande life, and therefore the wearer is often referred to as Sande when making public appearances. It is believed that high-ranking Sande women, Soweisia (sing. Sowei), are behind the mask during the rare public appearances. The Sowei presents herself in secret and is known as the Ndoli Jowei whilst wearing the mask. She diguises her identity by covering her body entirely underneath the voluminous blackened raffia and cotton skirt and shawl, which is generally attached into holes at the neck of the wooden mask with twine. Besides learning that the dancing Sowei wears black, and the initiates wear white during ceremonial rituals, I decided to go one step further and examine the blades of plant fibre found on the shawl. Through simple microscopy I was able to confirm that the plant fibre was raffia, therefore directly linking the object to this key figure of the Sande Society. The object required untangling and pinning out to reveal its netted structure. © CSG CIC Glasgow Museums Collection and University of Glasgow, 2016. I began my treatment by untwisting and untangling the shawl. The tangles were corrected with considerable patience however, I soon discovered that the threads held a memory and sprung back into a concentration of small kinks and curls no matter how much I eased them apart. I decided to pin out the object to its full potential length but without straining the threads. I introduced moisture using an ultrasonic humidifier to encourage the threads to relax into a more aligned composition. Pinning out the object also allowed me to identify the areas of damage in need of attention. The object was humidified to relax the treads into an orderly form. © CSG CIC Glasgow Museums Collection and University of Glasgow, 2016. As part of our training we learn various support techniques most widely used in professional practice, however these techniques are mostly aimed at woven textiles. 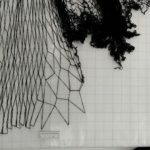 Therefore, the non-woven nature of the netted object required an alternative creative approach. 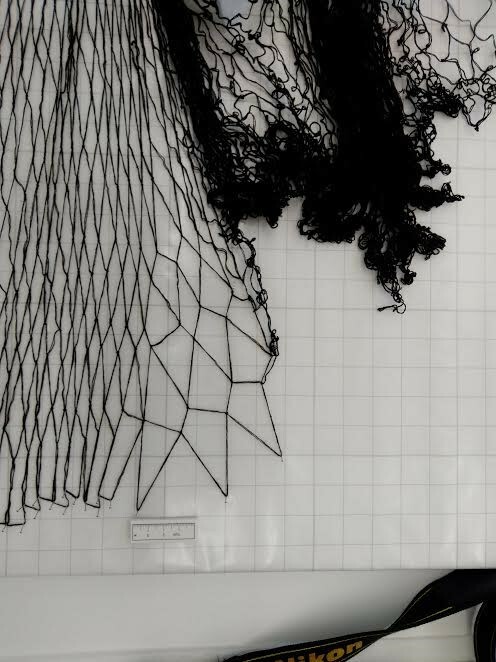 Reconstructing a sample of the net structure helped me to understand how the shawl was made and devise an effective method to support the areas of damage. Conservation of breaks© CSG CIC Glasgow Museums Collection and University of Glasgow, 2016. After some experimentation, I worked out a minimally interventive and easily reversible method to support the various breaks in the net structure. 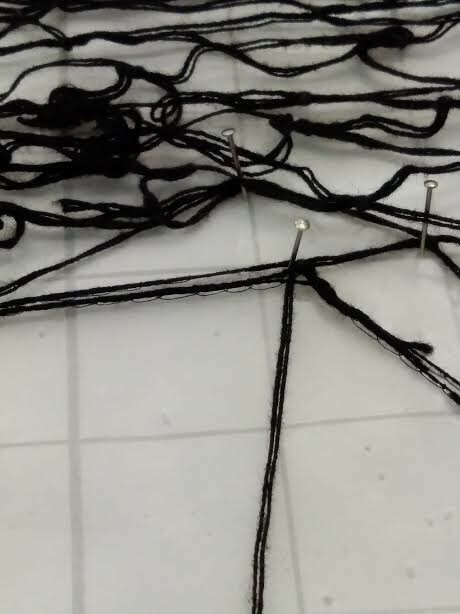 This was carried out while the object was pinned out so the support could be introduced under the same tension as net structure when it was first knotted together. I used a single strand of cotton embroidery floss as the support thread and laid it along each broken thread and secured it beyond the break at either end. I supported the break by bracing it to the support thread with button hole stitch using fine black thread. Once all repairs were made the net was unpinned and held its aligned and orderly shape. It retained its crimped texture allowing the repairs to disappear. Working on an object with such rich and fascinating provenance made me think completely different to any other object I have treated in the past. More than ever, I felt a great sense of responsibility and respect towards the object knowing the significance it held to the Sande Society in its lifetime. Research carried out for Reanimating Cultural Heritage, a major AHRC funded multidisciplinary project concerned with innovating ‘digital curatorship’ in relation to Sierra Leonean collections in Glasgow, Bristol, BM, Liverpool and Freetown museums has led to the website http://www.sierraleoneheritage.org/ . The website represents the most recent research carried on Glasgow’s and includes film clips, comment and also a complete image inventory of Glasgow Museums Sierra Leonean collections. Boone, Sylvia Ardyn. Radiance from the Waters: Ideals of Feminine Beauty in Mende Art. New Haven: Yale University Press, 1986. Philips, Ruth B. “Masking in the Mende Sande Society Initiation Rituals.” Journal of the International African Institute, Vo.48 No. 3 (1978): 265-277. Ruth Philips. “Women’s Art and Initiation in Mendeland.” https://africa.uima.uiowa.edu/topic-essays/show/33?start=23 (Accessed February 4, 2017). https://www.theguardian.com/global-development/2015/aug/24/sierra-leone-female-genital-mutilation-soweis-secret-societies-fear (Accessed February 4, 2017). Lovely work, Bevan. The project has so much more meaning having carried out your preliminary research. Very satisfying for you to know that it will now be preserved in such good condition for future generations to appreciate. Well done. Wow! Great work Bevan. Such interesting piece and work!